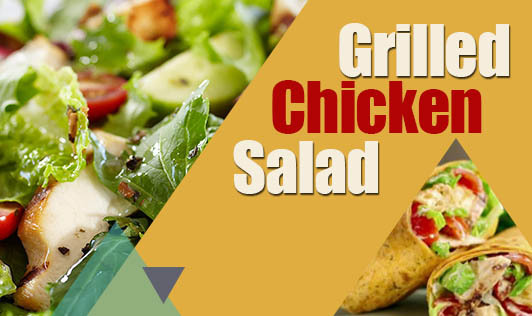 This quick and easy-to-make grilled chicken salad is sure to satisfy your taste buds. Boneless Chicken Breasts- 2 nos. Fresh Rosemary Sprigs- 2 to 3 nos. Fresh Thyme- 2 to 3 nos. Basil Leaves- 3 to 4 nos. Button Mushrooms Cut into Halves- 8 to 10 nos. Lettuce Leaves (Torn into Bite-Sized Pieces)- 2 to 3 nos. • Marinate the chicken breasts with salt, 1 tsp garlic, 1 tsp olive oil, 1 tsp balsamic vinegar, freshly-ground pepper, rosemary, and thyme, and keep aside for 10 to 15 minutes. • Mix mushrooms, bell peppers, freshly-ground pepper powder, salt, remaining garlic, and balsamic vinegar together and keep aside for 5 to 10 minutes. • Heat a non-stick grill pan. Add 1 tsp of oil and grill the marinated chicken till it's cooked evenly on both sides. Cut it into thick pieces and keep aside. • Heat 1 tsp of oil in a separate pan and sauté the marinated vegetables for a few seconds. • Whisk balsamic vinegar, olive oil, salt, and pepper powder in a bowl together to make a nice homogenous dressing. • Add the sautéed vegetables in a salad bowl. Add lettuce and the crushed basil leaves and toss well. • Finally pour the dressing into the salad bowl and give it a quick toss. • To serve, place the sliced grilled chicken and veggies on a plate. Drizzle some dressing and serve immediately.